Toronto-based Turnstyle Solutions, a company that helps businesses monetize their Wi-Fi, has formed a new partnership with SUBWAY® Restaurants that redefines how businesses interact with their customers. Gone are the days of wallets full of punch cards, customers need only opt-in to the Wi-Fi network at any SUBWAY location in Northern Ontario to be rewarded for doing what they do best – being a valued customer. “After 50 years in the marketplace, we haven’t forgotten our most valuable asset, our customers. We are constantly looking for ways to enhance the experience in store. Turnstyle’s technology was appealing because it evolves the way that we can interact with our consumers, providing a platform for direct communication and a new innovative reward system for our patrons, all through the Wi-Fi,” said Steve Beaudry, Board Chair of the local SUBWAY Canada Franchisee Advertising Trust. As an early adopter of Wi-Fi enabled location-based marketing, SUBWAY is distinguishing itself from competitors in the Quick Service Restaurant industry, demonstrating an interest in gaining a deeper understanding of the needs of their customers. 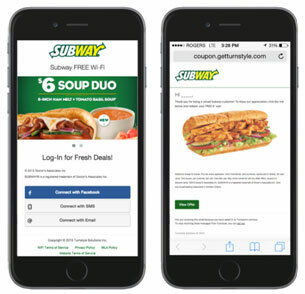 To kick-off the initiative which began on February 24th, SUBWAY is giving away a free 6-inch sandwich to every guest who logs into their Wi-Fi at participating locations in Northern Ontario. After joining for the first time, guests are pushed an in-store notification, containing a coupon to redeem a 6-inch SUBWAY sandwich of their choice, as a way to show appreciation for their loyalty to the brand. Once customers have opted-in, the network remembers them and each subsequent visit could offer them additional rewards. “We are constantly seeking innovative tools to add to our clients bottom line, by aligning communication objectives and authentically engaging with their users. Turnstyle was a perfect fit,” said Melissa Gallagher, Vice President of Twist Marketing. Twist Marketing leads the marketing initiatives for the Northern Ontario SUBWAY® region. Providing access to public Wi-Fi in hotels, restaurants, gyms, retail locations and any space where potential consumers are spending time has become necessary. Turnstyle Solutions works with brands to help them enhance their Wi-Fi service, enabling them to create customized campaigns triggered by location, loyalty (number of visits), date, or demographic information. The Social Wi-Fi feature attracts and identifies customers, while boosting awareness through social platforms. Turnstyle Campaigns, such as the SUBWAY experience, provides one-to-one customer engagement and amplifies retention and spend. At the same time, the Analytics feature allows clients to accurately track the success and ROI of various marketing activities and collect valuable foot traffic information to help them better understand their customer. This entry was posted on Thursday, March 5th, 2015 at 7:57 am and is filed under Business News, Digital Products, National News. You can follow any responses to this entry through the RSS 2.0 feed. You can leave a response, or trackback from your own site.